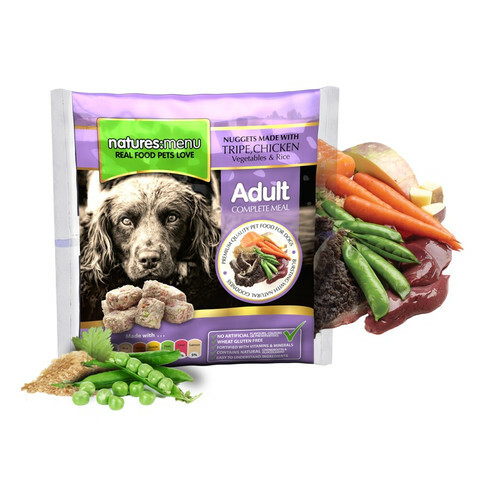 Delicious Tripe and free range Chicken Complete and Balanced raw meal. Tripe contains a diverse profile of nutrients including enzymes, natural Probiotics, and Phytonutrients. It has long been quoted by TOP breeders as being "the finest of natural dog foods". The supplementation of Grape Seed Extract has shown to reduce inflammation, limit platelet aggregation and reduce fat oxidation. Yucca extract is added to aid digestion and Green Tea extract is added for its well-known antioxidant properties. Protein (9%), Crude Oils & Fats (6%), Crude Ash (1.5%), Crude Fibres (1%), Moisture (70%).